8.25 mi | 1920’ ele. gain | 3.5 hr. I set out today, alone, to revisit Coyote Wall. 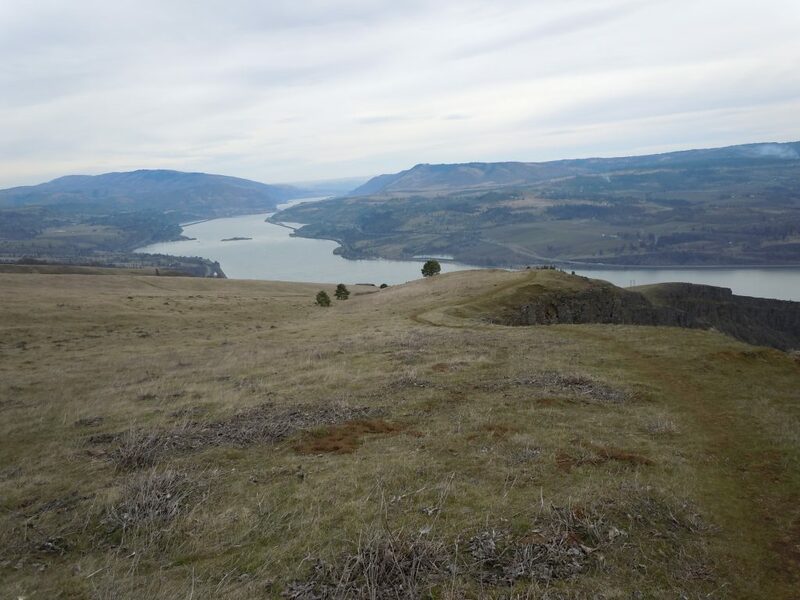 I came here once in 2008 and loved the tilted plateau with scenic views of the Gorge. It was a cool and breezy day, but at least the trails were snow-free. 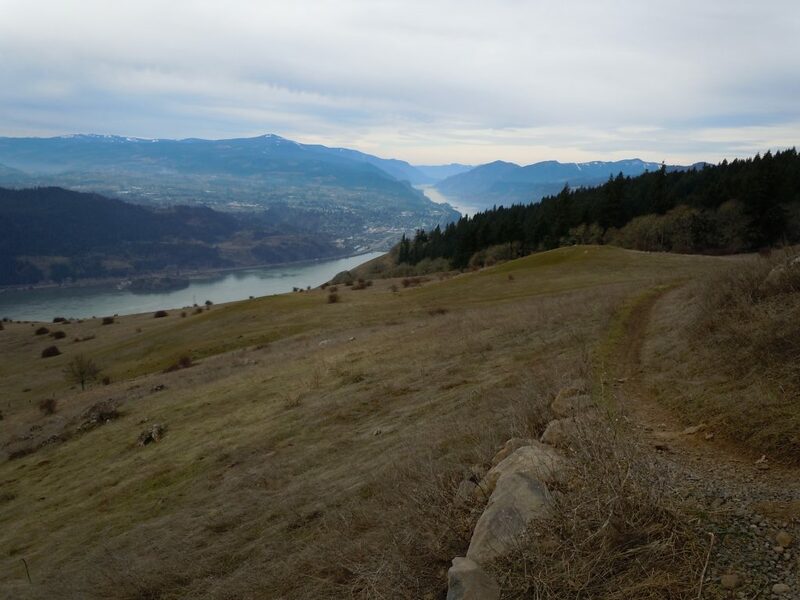 The eastern part of the Gorge is the dry side, which has much more reliable hiking options in the winter than the western part. The hike began at a gate. I walked through a brown, dry, open woodland on a narrow trail. There were occasional views of Coyote Wall, a towering rock cliff above a talus slope, fairly typical of this area. As I climbed higher, views of Mt. Hood began to appear. The peak blended into the clouds surrounding it, but it was still beautiful in its snow cap. The forest felt different here. On the west side, the trails are lined with towering Douglas fir, Western redcedar, spruce and other evergreens. But here, oak trees dominated. Their brown, bare branches poked skyward as their fallen, dry leaves lay flattened on the ground. 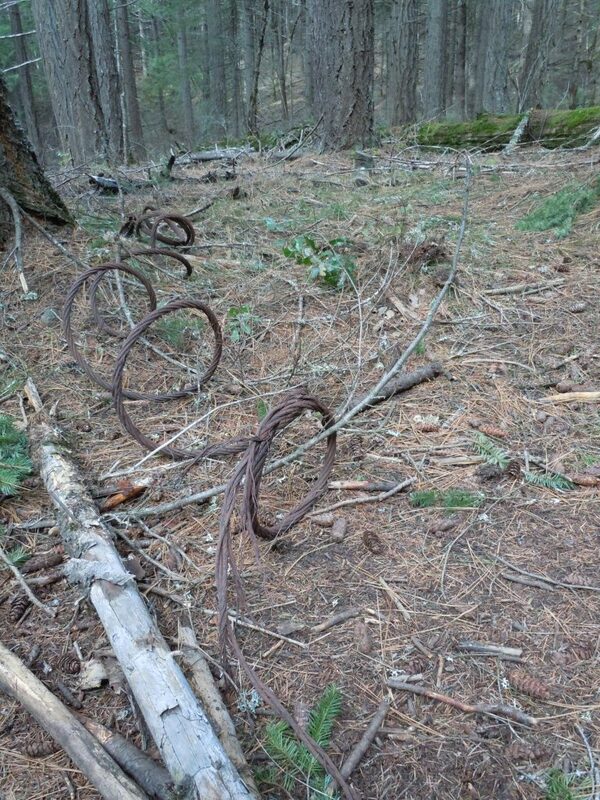 Bits of old foundations and coils of ancient cables popped into view as I walked along; remnants of another time. The trail came to Courtney Road and dozens of mountain bikes whizzed past. Now I found myself in a maze of roads and paths, not entirely sure where public land ended and private land begun. This was the worst part of this hike. The bikes, the cars, the network of roadways. I just wanted a walk in the woods. But I continued on. Finally, at the meadow, a wide open view of the river and Mt. Hood. Breathtaking. I walked along the braided trail, veering close (but not too close) to the edge of Coyote Walls to enjoy the open air and to feel like I had gotten on top of something today. To my surprise, I saw some little purple flowers sprouting in the meadow. A sign of spring. I savored the walk along the cliff edge, being battered by the wind, a tolerable side effect considering the incredible place I was in. Better the wind than the stupid bikes. They were out in force today. I took several photos of Mt. Hood. None were particularly good, but I kept trying. I still can’t believe I live here. More purple flowers. More meadow. More bikes. Get me out of here. I made it back to the closed road, the last little section before the car. Boulders lay on the cliff-facing side of the road, loudly announcing why the road was closed to motor vehicles. I wished I’d had a helmet, although if something that size came crashing down on me I doubt a helmet would really matter. I think this was my last visit to Coyote Wall. Too many bikes. I don’t think mountain bikers and hikers are compatible modes of transport. They’re too fast and obnoxious. I’d rather go somewhere else. This entry was posted in Hiking, Washington and tagged hike366 on February 12, 2011 by Jess B.